“It’s a Great Horned Owl!” I claimed….BUT… after further examination, NO it was not…it was just a Fake. Have you ever driven along a road when it is just starting to get dark outside or even later in the evening, and suddenly spot a Great Horned Owl up on the top of somebody’s roof? Then after you really study it for a few minutes you realize that it is just a decoy? It can be very disappointing because you really wanted it to be real, after all Great Horned Owls are so awesome to see! Why Are Fake Owls Used? Fake owls are used as a decoy to deter mostly birds from roosting on the roof of a house, on a deck railing, or anything that birds like to perch on. It’s the bird poop that people do not appreciate. It is also because of pigeons and woodpeckers too because they can be pests. We already know why someone wouldn’t want pigeons around but how can anyone be annoyed by woodpeckers? 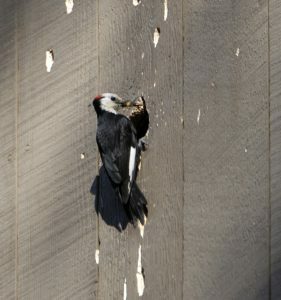 Well, believe it or not the woodpeckers like to drill holes in house sidings. There are four reasons for that. One is to make loud noise to let the other woodpeckers know that it is his territory and wants to attract a mate. Two, he wants to make a hole for a nest or to roost. 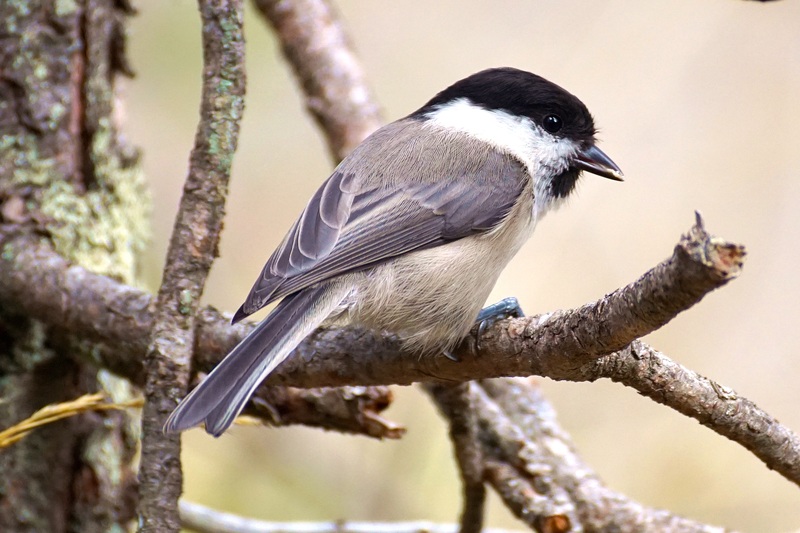 Three, it is feeding on insects such as carpenter bees, leafcutter bees, and grass bagworms. Four, it is storing food and thus could be making dozens of holes in your siding because it wants to put a single fresh acorn (in the case of an Acorn Woodpecker) into each hole. Now that is definitely a Pest! Quick Story…..My husband and I had a little experience with a Northern Flicker Woodpecker when we lived over in Ohio in a cedar sided house set in the woods. One day we noticed that there were quite a few holes drilled into the siding and knew who the culprit was. So my husband thought he would place little plastic flaps over each hole (knowing that a Fake Owl wouldn’t work) hoping that it would deter that woodpecker from making more holes. However, all the bird did was make another one. You can imagine all the little plastic flaps on my house. Another reason for the owl decoy is to keep rabbits at bay and other mammals. The rabbits like to eat in vegetable gardens and diminish all your crops. Then there are raccoons and opossoms that just get into garbage or are just a nuisance. Owls like to eat these varmints for dinner. Hence an owl decoy. Additionally, owls have special feathers on their wings that mute the sound when they are flying, so when attacking their prey it doesn’t hear it coming. That’s incentive enough for the intended target to stay far away so as not to get unpleasantly surprised. 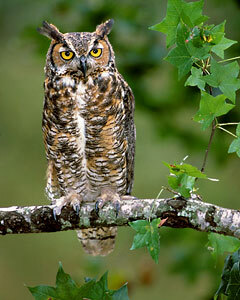 Plus Great Horned Owls with their piercing stare is 18 – 25 inches in height with a wing span of 3.3 to 4.8 feet. That is pretty scary to a smaller bird or animal and probably even to a human especially at night. Yes the owl decoy does work but only for a few days. Birds are not that dumb, after a few days and that owl is still just sitting there not moving or doing anything, well the birds just know that there is no threat to them. There are owl decoys that have the moving heads which make them a little more convincible, but it doesn’t take long before the birds figure out that it is not going to do anything to them. 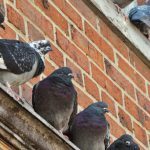 So What Can You Do To Get Rid of Those Pesty Birds and Critters? If you really are committed to getting rid of those nasty pigeons or mourning doves off of your roof, then go ahead and use the owl decoy but just remember to change its position every few days. That way the birds will think that it is real. 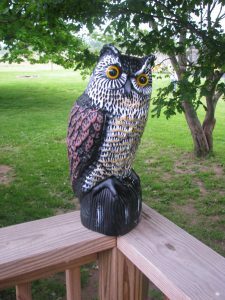 You can also place the fake owl in a tree or a natural setting and not a deck railing or rooftop. Owls are typically not seen resting out in the open on deck railings or rooftops during the daytime hours so they are a dead giveaway to the birds. There are also sound devices that make loud sounds at random that confuses the birds and may keep them away. Or some people like to hang old CD’s or ribbons on tree branches for added confusion. Sometimes it works, sometimes it doesn’t. If it is pigeons you are trying to get rid of you can use spikes to prevent them from roosting which you can purchase at a hardware store. People claim that these do work so it may be something to look into. Or as my husband and I would say, “DWI”., Deal With It people, especially if it is just a minor issue. A little bird poop on your deck can be sprayed off with your garden hose. Owl decoys may or may not be a good thing to use to get rid of the pesky birds or animals. Some people swear by them especially if they are moving them around in their yard periodically to trick the birds. However, then you just have to remember to move them. That can be a pain. Other people use the ultrasonic sound devices and feel that it works better for them. There’s no perfect remedy to stop the problem you just have to try what works best for you. 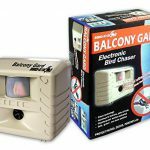 I would be happy to hear any solutions that you have used or are using to get rid of pesky birds. Please feel free to comment below. Posted in Backyard Birds, Owls, Raptors Birds of Prey and tagged decoy, great horned owl.